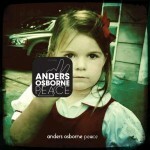 Share the post "Album Review: ANDERS OSBORNE – Peace"
There may be a significant gap between Alligator Records’ original mission statement of ‘genuine houserocking music’ and Anders Osborne deeply felt, confessional singer song-writing, but the contemporary blues scene has surely benefited from the liaison. It’s nearly 40 years since the Alligator Records started and ‘Peace’ sends out a confident message that the label is still backing adventurous music. It’s not just the way Anders has stretched the blues genre into his own unique roots rock mould that is a cause for joy, but also the way the label’s approach to artistic development has proved to be the perfect match for an enduring talent in need of nurture and a musical home where he’s appreciated. ‘Peace’ doesn’t comfortably fit any genre, save for the old catch all of Americana. The 11 tracks are shot through with an emotional veracity that makes musical labels irrelevant. Anders Osborne undoubtedly lives, breathes and plays the blues, but as he says himself, he’s on the outside looking in. He’s effectively a conduit through which we can understand life’s rich tapestry, as he dwells on a troubled past but looks to a brighter future. Some critics have praised him for his art, but that is only a partial recognition of music that is rooted in his soul, as evidenced by deeply personal lyrics and fiery guitar work. Anders has repaid his label with the best album of an already impressive career, adding instrumental colour to some intricately woven songs and imbuing his music with an essential drive and sense of purpose. He’s been called ‘original and visionary’ and ‘Peace’ bears that out. His passionate, observational and confessional songs draw you in and surprise you with their emotional depth, brutal honesty and musical ebullience. His songs are anchored by the same introspective feel favoured by many of today’s gloomy singer songwriters, but ‘Peace’ is more of a celebration of life and about finding his own sense of place. The notion of a spiritual rebirth is familiar fare for singer-songwriters, but a combination of eloquent melodies, intricately layered sounds and welcome musical variety makes ‘Peace’ special. You could argue that Anders had already moulded the template for his unique style on his last two albums. If ‘American Patchwork’ was a confident step towards exploring his psyche and honing his song-writing craft, then ‘Black Eye Galaxy’ glowed with the self confidence of a survivor. ‘Peace’ is another step forward as he raises the bar in terms of heartfelt songs that map out his re-connection with the world. He also impresses on a musical level, with a variety deep guitar tones and thoughtful arrangements that frequently mirror the feel, mood and meaning of a piece. The beautifully crafted songs are all interconnected, meaning that for every distorted tone and heavy duty riff, there’s a counter balance in tow. The album is full of contrasting guitar tones, snappy rhythms, crucial dynamics and uplifting hooks that make it memorable. The Neil Young inspired title track for example, is full of grunge guitar, sludgy rhythms and high-end vocals that buttresses the poetic imagery of a natural wordsmith: ‘I’ve seen dirty needles turn into wisdom and I’ve seen love I don’t understand, I’ve been looking for the same upon every mountain and down on every beach, playing all my songs all the way from Woodstock, down to New Orleans, and I’m still looking,…looking for a day of peace’. The heavy duty rocker is duly counterweighted by the subtle acoustic and organ layered rhythms of the very catchy ‘47’. The unexpected twists and turns are exemplified by the hypnotic groove of ‘Let It Go’ and the catchy Paul Simon influenced ‘Windows’, on which his autobiographical lyrics meet an ascending guitar solo that rises like a bird and soars into the outro. Then there’s a brace of segued, edgy mid-section songs that deal with urban paranoia, gun violence and urban unrest. The pulverising ‘Five Bullets’, is another Neil Young influenced song full of heavy riffs and a faux rap delivery, before a stark onomatopoeic couplet completes the hook: ‘Boom Boom Boom that American sound, teenage kids on the naked ground’. This entry was posted in ALBUM REVIEWS, ALBUM REVIEWS (Mobile), All Posts and tagged Alligator Records, Americana, Anders Osborne, blues, Jackson Brown, Neil Young, Paul Simon, Peace, Procol Harum, review. Bookmark the permalink.